Throughout 2018, the Ark-Tex Council of Governments and the 9-1-1 community is celebrating 50 years of 9-1-1. Rosette Propps with the Atlanta Police Department has been chosen as the first recipient of the ATCOG Public Safety Telecommunicator of the Year Award. This award recognizes an individual telecommunicator’s exceptional professionalism in the field of emergency communications. It also acknowledges the special contributions of a telecommunicator whose daily performance is an inspiration and example to others. Consideration was given in the areas of communication and leadership, and the telecommunicator’s ability to respond to unusual or special circumstances. Ms. Propps was selected, out of a pool of candidates from the nine county ATCOG region, based on the nomination letter submitted by Atlanta Police Department’s Communications Supervisor, Danielle Bloodworth. 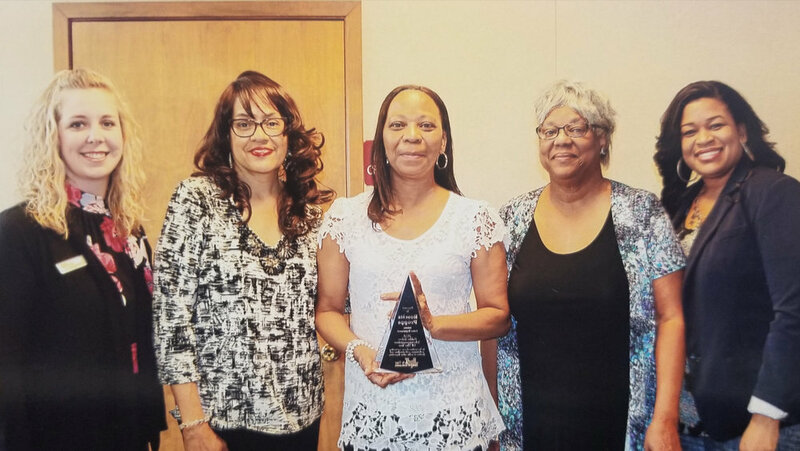 The award was recently presented to Ms. Propps at the ATCOG Board Meeting and at the Atlanta City Council meeting by ATCOG Deputy Director Mary Beth Rudel and 9-1-1 Program Manager Rea Washington. Rosette will also receive an all-expenses paid trip to the National Emergency Number Association (NENA) Conference & Expo in Nashville, Tennessee, scheduled for June 16-21.